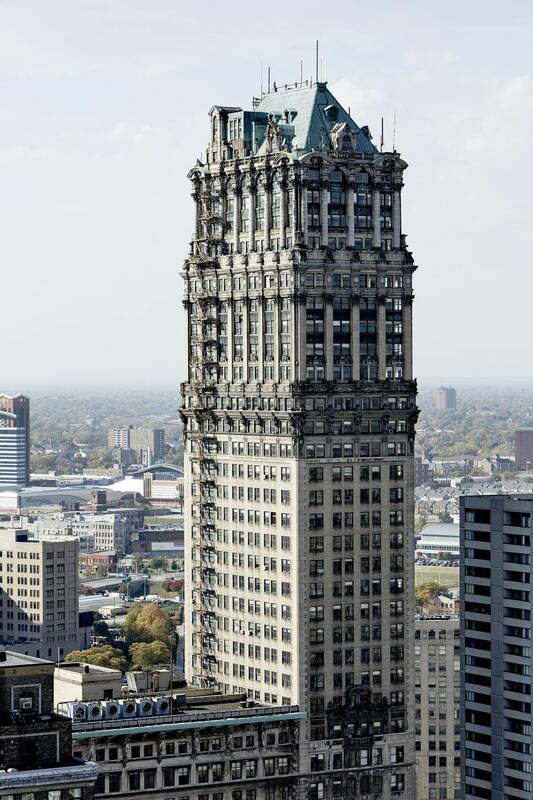 As Detroit works to restore its decayed downtown to former majestic glory, developer Bedrock Real Estate Services LLC is doing it by the Book. Bedrock is refurbishing Detroit’s long-vacant, 38-storey Book Tower, purchased last year along with an adjacent 13-storey building and two-storey community centre. Bedrock, started by Quicken Loans founder and Michigan resident Dan Gilbert, has been on a spending spree in the Motor City. The company now owns more than 80 properties in and around downtown Detroit. The purchase of the 517,000-square-foot, block-sized Book Tower property for a reported $30-million (U.S.) came just months after Bedrock bought another nearby historic structure, the 35-storey David Stott Building, along with a 10-storey loft building for $18-million. Less than five kilometres from the tunnel to Windsor, Ont., the Book Tower and adjacent Book Building are named not after literary tomes, but three brothers, J. Burgess, Frank and Herbert Book. The Books were early 20th-century developers who had a vision to turn the area around their property into a go-to destination. They were forced to scale back some of their plans by the Great Depression, though even in ruins the properties look formidable and imposing. “Work on the Book Tower started a few months ago. It’s really exciting for so many people to know that so much hard work is going into Detroit,” says Whitney Eichinger, Bedrock’s director of communications. The tower is an imposing 145-metre Italian Renaissance structure that was opened in 1926 but has been home mostly to rats and pigeons since the last tenant left in 2009. It’s a daunting task to renovate it. Just to light up the Book Tower last November required a half-dozen contractors spending an hour each lugging 20 kilograms or more of equipment per person up the 38 storeys, because the elevators had stopped working. As the intricate copper roof is rehabilitated, Bedrock hopes that the tower, which looks like it’s straight out of Gotham City, will house a boutique hotel, offices, main street retail and apartments or condos. Projects like the Book and Stott renovations are part of a building and infrastructure bonanza downtown. At the same time, restoring Detroit block by block and building by building is a formidable challenge. There’s lots of construction activity but also much evidence of lingering poverty and decline in the core. Detroit had a population of 1.8 million in 1950 but it dwindled to below 700,000 by this decade. It filed for bankruptcy in 2013 and its finances were placed for a time in the hands of a controller appointed by the governor of Michigan. Now, under its current Mayor Mike Duggan, Detroit’s redevelopment is managed through an alphabet soup of agencies and incentive programs, many being watched closely by other cities to see if their creativity will bring the desired renewal. Renewal initiatives have so far yielded construction of a new 20-station streetcar line scheduled to open next year, urban farming and programs that allow people to buy decrepit housing for almost nothing, as long as they commit to restoring or rebuilding within a given time. Detroit’s central core is now dotted with cranes and trucks amid the imposing architecture, new retail and restaurants. “It’s a good time to be in Detroit, the big national [retail] brands are coming back,” says Ms. Eichinger. While negotiations are still under way with retailers for space in the Book Tower and Book Building, in a sign of confidence for Detroit’s downtown, Nike opened a 22,000-square-foot, two-level store last May in a nearby part of downtown Detroit. The new Nike store is across from where Detroit’s legacy retailer, J.L. Hudson’s Co., which closed in 1983, was blown up in a controlled explosion in 1998 and now contains an underground parking lot. Nike is also close to where the new $627-million Little Caesars Arena is being built as the new home of the Detroit Red Wings, which will add to a sports-focused cluster that includes the Detroit Tigers’ ballpark and the Detroit Lions’ football stadium. In April, another of Mr. Gilbert’s development companies finalized a deal to buy the old Hudson site for $15-million and build a new high-rise, mixed-use tower. “Good things are happening here,” Ms. Eichinger says. In addition to the national retailers that the Book project hopes to attract, Ms. Eichinger says local, iconic brands in the neighbourhood are also helping to give Detroit a new artsy, hipster swagger. She points to retailers such as Detroit is the New Black, Pure Detroit and Shinola, all of which have opened urban boutiques and market upscale, often locally made goods.